14 year-old Junior is growing up on a rural Indian reservation in Washington state. I thought this was a great book, very moving. I hadn't realized that the book would be illustrated with cartoons, like doodles in the margins. With great humor, Alexie takes a look at the extreme poverty and hopelessness faced by many indigenous peoples today. Nearly everyone Junior knows is an extreme alcoholic, and many meet an early death. His sweet and wise grandmother is hit by a drunk driver. His father leaves the family to go on a bender over Christmas and ruins yet another holiday. A family friend is shot in the face by his drinking buddy over the last sip of wine in a bottle. (The shooter later hangs himself out of grief and sorrow.) Worst of all, his beloved older sister runs off to Montana to get married, and dies in a fire after a cooking accident at a party where everyone had passed out drunk and failed to escape. In light of all this, Junior carries on, poking fun at things where he can, determined to get the best education possible, by commuting to the school off the reservation (or rez, as the locals call it.) Junior struggles to fit in at his new school, and joining the basketball team seems to open doors for him, even as he begins to feel that he doesn't fit in either of his worlds. You know that old saying, "laugh so you won't cry"? The overwhelming heaviness of the subject matter is mitigated by Junior's self-deprecating humor and determination to just keep putting one foot in front of another, no matter what. Charming, funny and sad, I'm only sorry that I put off reading this book for so long. 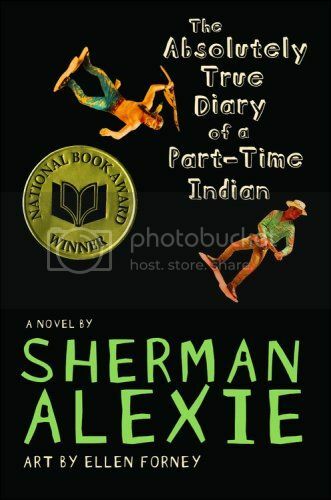 I love Sherman Alexie, but I haven't read this one yet. I want to though. And it's great for Banned Book Week. Yes, absolutely. I've been sitting on this review for a while and thought this week would be a good time to put it out there. Additionally, part of the reason why I reviewed Bumble-Ardy this week is because it hasn't been banned yet, but I predict it will be. It's just such a weird book.